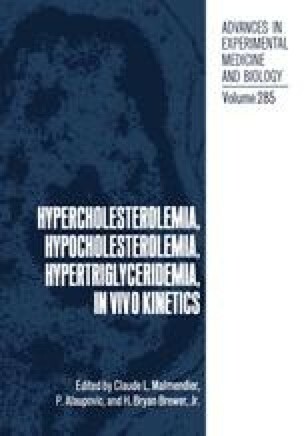 The physical properties of apolipoproteins in solution and when interacting with lipids have been extensively studied using various experimental methods ( 1 ) . In water, these molecules appear to be in equilibrium between a statistical coil and some folded conformers containing α-helices. When interacting with lipids, the α-helical content increases to reach values around 60% for apolipoprotein A-II for example. Taking these observations into account and looking at the results obtained when rules to predict secondary structure are applied to the sequence of apo A-II we proposed recently ( 2 ) that the tertiary structure of this molecule could be similar to the one of uteroglobin which is a little steroid binding protein of known crystalline structure ( 3 ). In particular, we observed that the regions of high helical content appear to be located at similar posi tions in the two molecules being in both cases delineated by proline residues. Furthermore, the occurrence of these helical regions gives rise for the two molecules to a clustering of hydrophobic residues. In the crystal, uteroglobin is a dimer made of two identical monomer units containing each four α-helices which are packed in space according to the scheme depicted on Fig. 1.